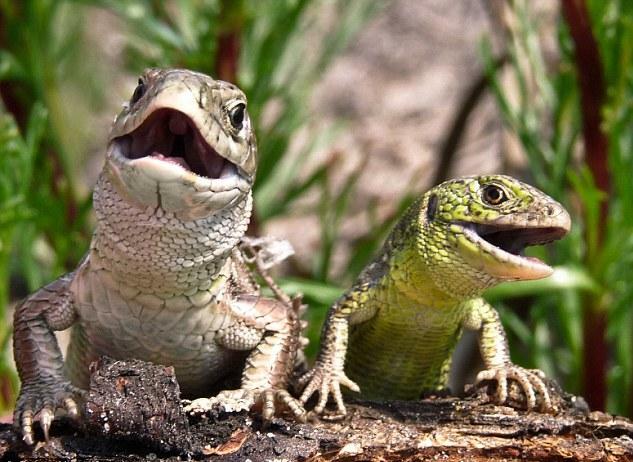 A photographer from the Ukraine, Tymoshenko Alexey was accidentally captured a moment in which a male lizard present a bouquet of flowers to lizard girlfriend. When she climbs up to accept the flower, the protected lizards form a heart shape. The female loses balance and dramatically slips and falls off the plant – only for her new love to dive down and catch her. ‘I took these pictures in the back of my parents house in Ukraine. I’ve been visiting there ever since I left home,’ Alexey, 19, said. ‘When I was a child one of my favourite things I used to do was play in the garden and watch the lizards. ‘Usually 30 minutes is enough for them to understand you won’t do them any harm and now I can photograph them without them being afraid of me. ‘But I never thought they could be so passionate and helpful to each other. It was amazing watching one drop and the male dive to catch her.